Abby Kennon was able to return to her roots for her summer internship and use her passion for agronomy to serve her community. Kennon, a junior majoring in agronomy, spent the summer in her hometown of Cresco, Iowa working as the 2018 Borlaug-Thomson intern with the Norman Borlaug Heritage Foundation. The experience was far from relaxed. The very first day of her internship, she was already making a trip to Des Moines to meet with a strategic planning committee at the World Food Prize to discuss funding and grants, which was one of Kennon’s goals for the summer. Another goal was to create more traffic flow through the Norman Borlaug boyhood and birthplace farm that they have. One way she tried to increase that was through successfully planning and executing a cover crop field day, which was open to the public. In order to coordinate the event, Kennon had to learn a lot of new skills. Although it was unexpected, the areas she expanded her knowledge in most throughout her internship were marketing, advertising and communication. Kennon’s efforts were a success. Instead of the typical attendance of a handful of people, the event had around 30 people attend this summer. 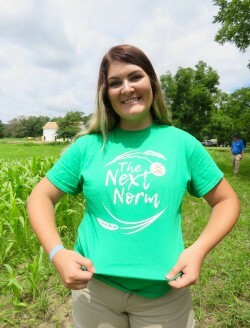 As the Norman-Borlaug intern she also worked with the county coordinator to organize day camps for children, and had an entire week dedicated toward helping the Howard County Extension Office with the Howard County Fair. Growing up, Kennon would show animals or help out at the Howard County Fair, which is where she was first exposed to past Borlaug-Thomson interns. Kennon said the board members of the foundation also had an influence on her applying the internship. In the future, Kennon wants to take what she has learned from her experience as an intern and Borlaug’s work and pursue international agriculture education.